Minister of Transportation Steven Del Duca gives the thumbs up after arriving at Monday's announcement in an autonomous car. Ontario issued its first permits for autonomous vehicles on Monday, meaning the first driverless car will hit Ontario’s public roads during the first quarter of 2017. Autonomous vehicles owned by the University of Waterloo, Blackberry and the Erwin Hymer Group have all been approved for testing on the province’s roads. Ontario launched the Automated Vehicle Program in October 2015 but had received no applications for permits and public testing through at least July 2016. It took nearly a year for the first company to apply for a permit to test autonomous cars on provincial roads. The province didn’t say how many applications were put forward or whether any were denied. 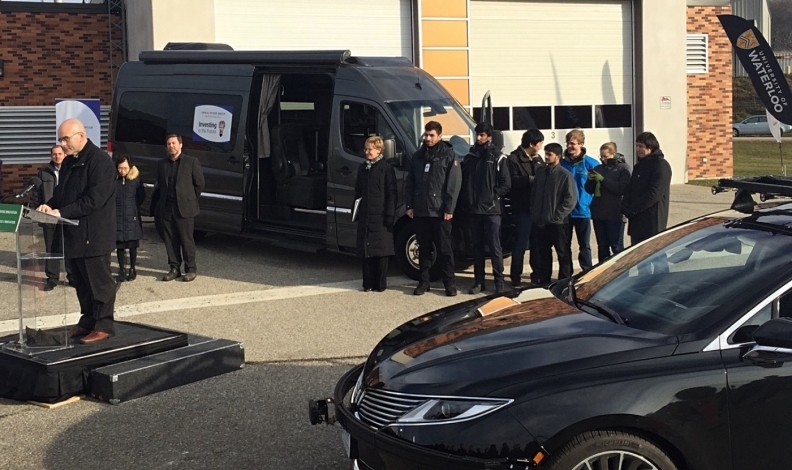 The University of Waterloo Centre for Automotive Research (WatCAR) is currently testing two autonomous vehicles in a large parking lot in Stratford, Ont. The school plans to have one of them -- with a human at the wheel for safety’s sake -- on the road during the first quarter of 2017. McKenzie said the approval process took two months. A licensed, functioning vehicle was needed and the school had to indicate its intentions for the vehicle. “I would say it was reasonable process. It wasn’t fast, but it was complete and thorough without being onerous,” McKenzie said. The permits allow companies and researchers to test autonomous technology in real-world situations on public roads. “Autonomous Vehicles can only be on the roads with a permit -- the permit must be with the driver and in the vehicle at all times it is being driven -- and there are a few safety precautions inherent to the pilot,” Ministry of Transportation spokeswoman Andrea Ernesaks said in an email. For example, the driver of an autonomous vehicle be present in the vehicle at all times, in the driver’s seat, and have a valid driver’s license for the class of vehicle being operated. Waterloo’s autonomous vehicle comes with a bright red kill switch, outlined with a yellow circle, that will disable the autonomy at a moment’s notice, McKenzie said. Traditional drivers’ rules of the road also apply to someone operating an autonomous vehicle. “This is a direction in automotive engineering innovation that we are proud to lead in Canada, and we applaud the Government of Ontario for their foresight,” said University of Waterloo’s Dean of Faculty of Engineering Pearl Sullivan, who was taken to Monday’s announcement in an autonomous vehicle. Minister of Transportation Steven Del Duca announces that Erwin Hymer Group will test one of Daimler AG's Mercedes-Benz vans. The University of Waterloo will test two Lincolns equipped with autonomous technology. Erwin Hymer Group will test one of Daimler AG's Mercedes-Benz vans, the province said. Ontario Minister of Economic Development Brad Duguid said the province is a perfect place for autonomous testing. “Ontario’s innovation ecosystem, with leading clusters in automotive, information technology, and cleantech, makes the province the ideal location to develop the disruptive technologies -- like this AV pilot -- that will shape the future of the industry,” he said in a statement.